Three months old. See her at two and one month. oh my! she's just a gorgeous little girl. They grow so fast. Sigh. melts my heart. SO cute. 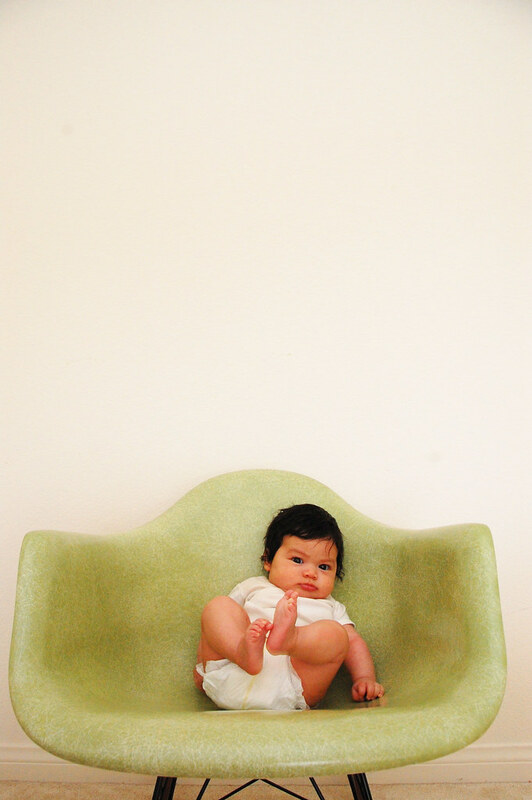 Getting more and more precious each month, and look how tall she's getting, almost reaching the top of the chair! Not to take away from your beautiful daughter, but that chair rocks!! She's growing so fast. She is so beautiful. i love babies. she's so adorable! we did something similar for my daughter. we did pictures of her in our old 70's recliner sitting next to a large kermit doll. it was fun to watch her interactions with kermit change as she grew. oh goodness, she is so adorable! my baby sister will be three months tomorrow. i know my baby gets chubbier and chubbier by the month! Your baby is SO CUTE! I love her thick, dark hair! She is perfect! This cute picture makes me say, "Ugh, why does my husband have one more year of law school?!" I would so have a little cute one right now!